The monosynaptic spinal stretch reflex consists of glutamatergic Ia muscle spindle afferents synapsing on α-motoneuron (α-MN) dendrites. Also, renshaw cells (RC) mediate a direct recurrent inhibition of α-MNs potentially via GABAA and glycinergic receptors. The RC synapses are confined to α-MN dendrites. Several studies have implicated a GABAB receptor mediated pre-synaptic inhibition of the Ia terminal during reflex generation. Supra-spinal inputs further modulate the efficacy of the synaptic inputs to the α-MN, e.g. brainstem nuclei exert a tonic monoaminergic inhibition on RCs. Following spinal cord injury (SCI), hyper-reflexia and motor spasticity occur with concomitant α-MN hyper-excitability. The hyper-excitability has largely been attributed to an enhancement of dendritic persistent inward currents (PICs), while inhibitory pathways may also play a role. However, the effect of a combination of PIC enhancement and changes in inhibitory inputs on α-MN excitability is yet unclear . In this study, we use a network model for the monosynaptic stretch reflex with RC-type recurrent inhibition of the α-MN to test the hypothesis that GABAergic inputs are essential for suppressing α-MN hyper-excitability after chronic SCI. We use conductance-based Hodgkin-Huxley formalism to represent individual neurons within the network. The α-MN is modeled using separate soma and dendritic compartments to signify the dendritic confinement of Ia and RC synapses and PIC channels. The synaptic variables for GABAA, glycine and Ia afferent input are modeled as scalar equations while a constant current input represents the slower GABAB pre-synaptic Ia inhibition. The rise and decay rates of GABAA currents are ~3 times slower than the glycinergic currents. The tonic inhibition to RC is modeled as a constant current. Model simulations are performed using the XPPAUT software. The model α-MN shows hysteresis in the firing frequency-injected current (f-I) relationship (A) similar to experiments. Presence of RC inhibition is able to mask the f-I hysteresis (B). 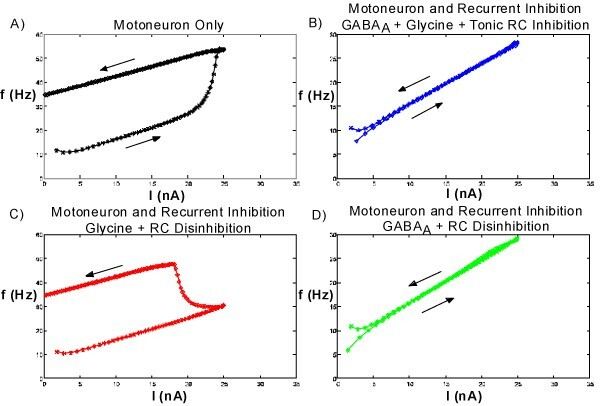 Disinhibiting RC to mimic SCI and eliminating GABAA (C), but not glycine inhibition (Fig. 1D) recovers hysteresis. An increase in RC inhibition due to disinhibition may not be sufficient to suppress f-I hysteresis. In the presence of Ia input, removal of GABAB inhibition of the Ia terminal alone unmasks the hysteresis. These results suggest that GABA-receptor mediated inhibition and its slower kinetics are integral for control of α-MN excitability. F-I curves; upward and downward arrows represent f-I response for increasing and decreasing currents respectively. Baclofen (GABAB agonist) treatment after chronic SCI alleviates pain and spasticity. Moreover, recent DNA microarray studies suggest down regulation of GABA receptor genes 7+ days post SCI . Our model prediction support these experimental observations and provide directions for further studies to characterize spinal GABAergic mechanisms in the control of α-MN excitability chronically after injury. This work was supported by NIH R01-NS054282.